• What's causing the waves? The size and shape of waves will depend on whether they are caused by wind, current or boats. You could have smooth swells from a storm far away, steep chop when a strong breeze blows over shallow water or when current flows against the wind, or random chop from motorboats in a spectator fleet. • Are the waves the normal size that you would expect for the wind velocity? For various reasons, the waves might be larger or smaller than normal (see below). This could have huge implications for steering, trimming and sailing the boat. • Are the waves perpendicular to the wind direction? 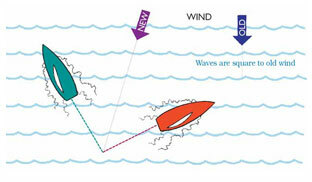 If the waves are flowing in the same direction as the wind, then you will generally have symmetry from tack to tack. But If not, you will need to set things up differently on each tack. • Are you going faster or slower than the waves downwind? Figure out if the waves are helping you (i.e. they're going faster than you) or hurting you (you're faster than them). Also, do surfing conditions exist? This is key to knowing if you are allowed to pump your sails. Here are further explanations of some of these concepts. When you're racing upwind, are the waves equal on each tack? They are usually similar on port and starboard tacks because waves are created by the wind and therefore they come from that direction. However, this is not always the case. Sometimes the waves are not perpendicular to the wind, and this can have a huge impact on the way you sail your boat. • Windshifts - If the waves are at first aligned with the wind, any change in wind direction will make them unaligned (at least for a while).This is very common. • Presence of nearby land - If there is land to windward of the course, it could affect how waves move across the racing area. • A distant storm -When you're racing on the ocean, there are often swells coming from a direction that's very different from your sailing wind. • Cross-current - If you have a strong current that is not aligned with the wind, it often creates waves that aren't square to the wind. When you first start sailing in your race area, check to see if the waves are the same on each tack. If not, make the appropriate sail trim adjustments. For example, you will have to make your sails fuller and more twisted on the bumpier tack (which goes more directly into the waves). On the other (smoother) tack you may be able to trim your sails much flatter and tighter. You can point higher on this tack, too, and keep your weight a little farther forward. There are also strategic implications of wave asymmetry. For example, if port tack is smoother it might mean the wind has shifted to the right. When wave asymmetry is caused by a persistent windshift, it's better to sail the smoother tack first since that will take you in the direction where the wind is shifting. It would be hard to run most sailboat races without motorboats, but it sure would be nice if we could run them without motorboat wakes! Unfortunately, waves from motorboats are a fact of life in most racing venues, and the good sailors simply figure out how to handle them. Motorboat waves differ from wind generated waves in several important ways. They are often steeper and closer together (and therefore can potentially hurt your speed much more). Boat waves typically hit you at strange angles (rather than straight with the wind). And, fortunately, they usually come and go pretty quickly. The first rule for maintaining speed through waves is to hit them at an angle (instead of head on).This is normally worth doing even if it requires a significant alteration in the course you have been sailing. In fact, it may even make sense to tack or jibe so big waves hit your stern rather than your bow. The second rule of thumb for motorboat waves is to make sure you are going fast just before you hit them. In other words, be proactive by bearing off (or heading up on a run), easing (or trimming) your sails, moving weight aft, etc. Don't wait until the first wave hits you before making these changes! As I mentioned above, you ideally want to hit motorboat waves at an oblique angle and fully powered up. But sometimes you can't do both. When the waves are coming at you parallel to the wind, you have to make a choice. It's usually better to hit waves at an angle even if you have to pinch up and lose a little speed. This seems better than bearing off for speed and hitting the waves head on. In any wind velocity, there is a certain size and shape of waves that you normally see with that amount of wind. In a five-knot breeze, for example, the water surface should be almost totally flat. In 18 knots of wind, however, you expect to see fairly good-sized waves with whitecaps. But as every sailor knows, you don't always get 'normal' sea conditions. You might see bigger or smaller waves than what's typical for that wind velocity, and this will affect how you set up and sail your boat. When I'm racing, I categorize the wave state in three general ways: 1) Normal waves for the wind; 2) More wind than waves; and 3) More waves than wind. Here's a closer look at each. This is almost always a fun condition for sailing (unless you're trying to do a windy jibe). It's great (or painting and speed, and makes staying in the 'groove' pretty easy. • An offshore breeze—the water is flatter as you get closer to land because there is less 'fetch' for the waves to build. • Current flowing with the wind. When you have more wind than waves, you can trim your sails flatter and harder than you normally would in that breeze. You should sail most boats as flat as possible and go for maximum height (pointing). This is almost always a tough condition for sailing (unless you are sailing downwind with enough breeze to surf). It makes finding the groove difficult, and it quickly separates the good sailors from the rest. • A dying breeze—the breeze always changes faster than the wave state. • An onshore breeze—when the wind is blowing toward the shore, it usually has a long 'fetch' for the waves to build. • Current flowing against the wind. Waves make sailboats go up and down, and they also push boats to leeward. 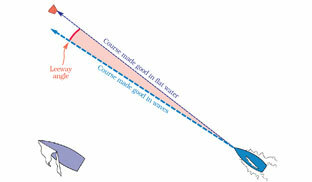 The difference between the course you steer and the course you make good through the water is your leeway angle. The size of this angle is a result of many factors such as heel angle, wind velocity, boat design and wave height. Though leeway for racing boats is usually not more than a few degrees, it will get slightly larger as the waves get bigger. The main place where you will notice leeway is in relation to fixed objects like marks. 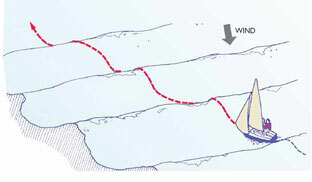 Your laylines are wider, for example, in waves, so you must allow a little extra distance before tacking. One place where it's easy to see how much the waves push you to leeward is at the starting line. When boats attempt to luff in place on the line, they often slide much farther to leeward than they think. That's one reason why there is often a significant line sag when the waves are big. Except for those few times when you are able to ride a motorboat wake coming from behind, waves are never helpful when you're racing upwind. It's always faster to sail in flatter water, and that should be your first rule of thumb on beats. Sailing fast in waves requires a team effort that involves the driver. trimmers and the rest of the crew. You have to look ahead for waves that are coming, shift gears and find the best way to steer through them. There are three basic strategies for dealing with waves upwind. You can sail directly through the waves, steer over the waves, or try to avoid the waves. More likely, you will do some combination of the above. Going straight through waves is usually the best option when the waves are everywhere and too small to steer around. The bigger and heavier your boat, the more likely you are to take this approach since it's often impossible or slow to turn your rudder for individual waves. This is not a great option for bigger waves, but sometimes it is your only choice (e.g. when all the waves are big and steep!). In that case, try to keep the boat going a little faster than usual up the beat. The most costly mistake is to be too slow when you hit a bad wave. Anticipation is important. The key to maintaining speed through bad waves is to shift gears before you get to them. That means you need enough warning to power up your sail plan before the bow digs into the first wave. Steering over the waves is a good idea when they are larger and spaced farther apart, and when going straight through them is slow. The smaller and lighter your boat, the more effective this is. The basic technique for sailing over waves is to head up on the front side and bear off the back side. In other words, luff toward the wind a little as you go up the wave and then bear off away from the wind as you go down the back side. The steeper the wave and the faster your speed over the waves, the more sharply you will have to turn your helm and your boat. In boats that are light enough to be affected by the positioning of crew weight, combine the steering with a rotational movement of your bodies: Lean aft (and maybe in a little) as you go up the wave. Then lean out and forward as you go over the top and down the back side. Avoiding waves is always the preferred option. This works well when you have identifiable areas of bad waves, such as boat wakes or sets of especially large, steep waves. Since you can never avoid all waves, you must use this in concert with other ways to sail through waves but this strategy should always be a part of your upwind plan. The techniques that work best in waves are often subtle enough that you never know how well they are working until you measure your performance against nearby boats. So test your wave strategy before the start and continue to evaluate it during the race. If you're not fast, change something and try again! One of the reasons why waves make a boat go more slowly is because they cause it to 'hobbyhorse,' which disrupts the air flow around its sails and the water flow around its foils. This is especially harmful in lighter air. The main goal of positioning your weight in waves, therefore, should be to reduce hobbyhorsing. Keep your crew together as much as possible and near the middle of the boat. In light air, the ideal spot is right at the top of the keel, since that is the point around which the sail plan, hull and foils pivot. When conditions are bumpy and light, it's not unusual for crews to sit down below on the cabin sole (in bigger boats) or to crouch down inside the cockpit (onedesigns). This reduces the range of motion of the mast and keel/centerboard. In heavy air the crew can't be inside the boat, of course. Instead they should sit tightly together like the crew on the boat above. The fore-and-aft position of their weight depends on the boat, wind strength and wave shape. Generally, the crew should be at least slightly farther aft when it's rough (than when it's flat with the same wind velocity) to keep the bow from plowing into waves. If you're racing upwind in waves and you think your weight is positioned perfectly but you aren't going fast, try moving your crew a little farther apart. Sometimes the boat doesn't 'click' with the natural frequency of the waves—but different crew spacing may improve this harmony (and therefore your speed!). How much to steer in waves! When you're sailing upwind, waves will always slow you down, so you should avoid them as much as possible (see below). However, when you turn your rudder to steer around waves, the drag you create will also make you go slower. Therefore, you are always searching for the optimal tradeoff between using a lot of rudder and missing waves versus using less rudder and hitting waves. The only true way to judge whether you are doing a good (fast) job of this is by comparing your performance to that of a nearby boat. That's why it's critical, when you have waves, to train with another boat if possible and to tune up with a competitor before every race. While you are doing this, try different steering techniques to see what is fastest in the unique conditions that you have on any day. The last thing you want to do in a wavy race is to be looking for the groove as you come off the starting line. • Characteristics of your boat - Is your boat large or small (relative to the waves), light or heavy? Does it turn easily? Does it have a narrow bow that cuts easily through the waves or a fat bow that slams into waves? All these factors affect the tradeoff of hitting a wave versus turning to miss it. One thing that's true for all boats and waves is that when you turn the boat, it's best to do this with as little rudder as possible. Reduce drag by steering with sail trim and body weight. For example, use windward helm to allow the boat to carve its own turn to windward on the front of the wave. Then, at the top of the wave, hike out hard and ease the mainsheet or traveler to help bear off down the back side. If you can turn the boat without so much drag, then the tradeoff moves in the direction of steering to miss more waves. These waves are unusually large, uniform and rounded on top, so it's not necessary to steer around them very much. The ideal course would be a gradual, slight arc to windward on the approaching face of the wave, followed by a similar bearing off down the back side.